My first job was working for a manufacturing engineer, I was 13 and it was my school holiday job and I continued to work there every school break until I finished secondary school. It was the same company my Dad has now worked for for over 35 years. After my abortive attempt at university I went to work for them again on a part time basis and then full-time for a another couple of years. It was a business that made a variety of things, but importantly most of the things they made were built completely in house, they had their own foundry as well. From memory the only things that come from outside the factory were raw materials and items made of plastic, as they'd decided long ago not to set up any plastic moulding facilities. It was a place of noise, hot oil and wonderfully crafted items of bronze, brass, stainless steel and alloy. Ted James is a designer and builder of frames, formerly in London and now in Gloustershire, and he's a rare bird these days. 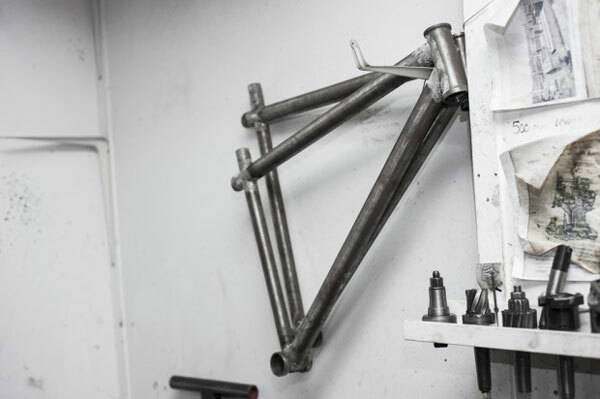 He considers himself more of an artisan than an engineer as a lot of his work is creating bespoke bikes, not cranking out the same frames. Check out examples of his work here and the video below.